Under great pressure, Kenton Klassen (left) as Neo-Nazi Mike and John Voth as young lawyer Danny gradually learn and reveal their motivations to each other with surprising results. When the only complaint you have about a play is the name, you know it’s good. The title of Pacific Theatre’s current offering is “Cherry Docs,” a reference to an obscure brand of steel-toed boots. “Cherry Docs” opens with cacophony assaulting our ears. The set in the alley theatre, one end institutional green with a steel window, a key card swipe at the door, a garbage can, a highly visible security camera and a standard issue clock on the wall. The other side is simpler, a table and a few chairs with another exit door with another card swipe. It turns out, Cherry Docs are a type of Doc Martin boots that the skin-head wore to kick a man of colour to death. Mike Klassen, as Mike, the unrepentant Neo-Nazi points out that carrying something in his hand to hurt someone is considered a weapon but wearing steel-toed Cherry Docs can do the same damage but not get him caught carrying a weapon. David Gow’s play is complex. It starts with a clearly defined antagonist and protagonist but, like real life, nothing stays straight forward. This is a play about redemption, on both characters’ parts. But this redemption takes struggle and the fist step which is realization. What was to be a legal-aid case to make a young lawyer’s name, a young lawyer who knows how he accepts all people in their differences, affects him in ways he never anticipated. The fall-out is life-changing. John Voth, last seen as the young man in Pacific Theatre’s Christmas production of “The Lion, The Witch and the Wardrobe” plays a powerful, utterly convincing role in the young lawyer, Danny. Equally powerful, Klassen portrays the skin-head with frightening clarity showing both his anger and later his needs, a need for community amongst what others see as failure, a need that drove him into the arms of Neo-Nazis. When he finally says with great passion, “I’m a wasted person, a waste on this earth,” the veneer of hatred cracks, letting our realization of who he is seep in. At another point, this young man cracks mentally, snapping into soldier mode, showing the power of his indoctrination. 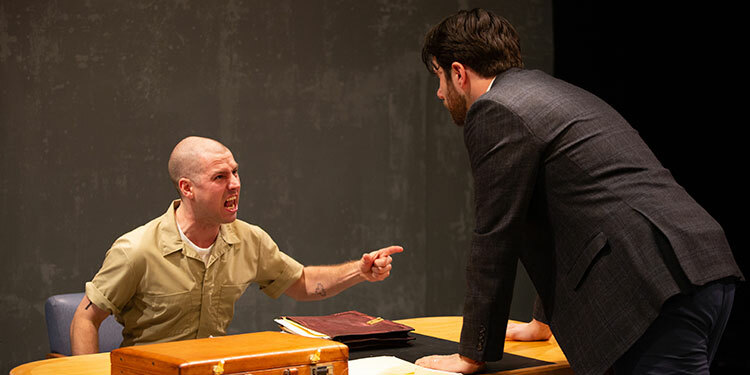 Also an educational play, “Cherry Docs” playwright says to us, through Neo-Nazi Mike, that this is not small problem with a few people that there are thousands, tens of thousands in this country, hundreds of thousands around the world who feel the same way he does and they are organized. He asks what good locking him up will do when prison is full of people who feel like he does, young men who feel victimized, not by the power elite who rule but by other visible minorities. The direction by Richard Wolfe is flawless. Every moment, every sound, every word is clear. The blocking seems natural yet must have been well though-out because, with audience on two sides, each person watching felt the show was put on for them. There was never a moment one side felt ignored. Hard to do in an alley theatre. If you like serious theatre done with skill and finesse, “Cherry Docs” is for you. One person in attendance described “Cherry Docs” as playing hide-and-go-seek on a squash court. It’s most apt. After the performance, both actors praised Gow’s writing saying it made getting into character easy when the words led the way so succinctly and vividly. Pacific Theatre and Cave Canem Production have a powerful play, superbly done on their hands. Luckily for those in the Lower Mainland, it runs until April 28 at 1440 W 12th Ave, Vancouver. For info and tickets call 604-731-5518 or click.